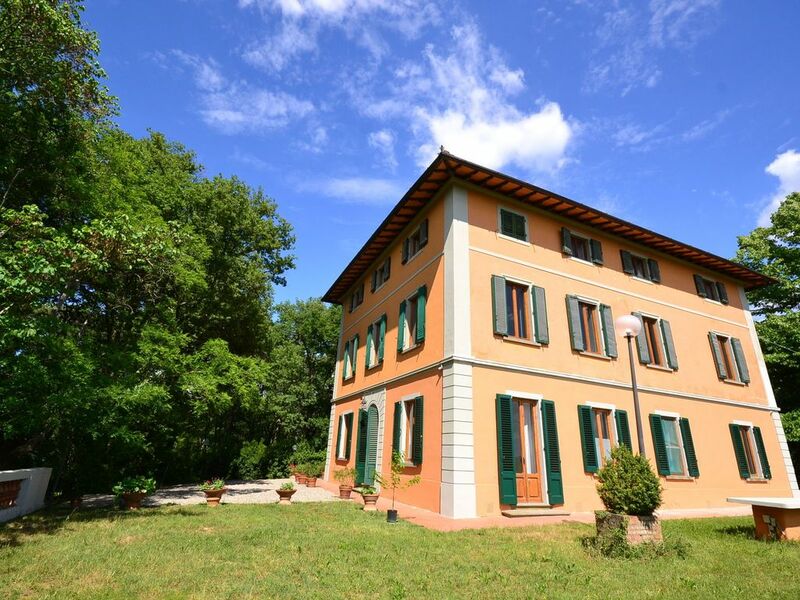 This villa, dating back to the first half of the 1900s is located in the Chianti hills, close to San Casciano in Val di Pesa. Set among lush greenery and nestled in the quiet Tuscan countryside, the villa boasts a large, panoramic terrace next to the garden with pool. The property is embellished further by extensive woodlands and a pine forest. Even the outside areas feature Wi-Fi access and guests can park with ease just in front of the house. The villa's position makes it easy to visit a variety of Chianti towns as well as Florence itself, which is only 30 km away. Siena is just 50 km away. Es war großartig, mit sehr aufmerksamen und zuvorkommenden Vermietern. Tolle Lage, grosszügig ausgestattet, charmantes Haus, eigener Wald (wo gibt's denn so was) und sehr sehr freundlichen, aufmerksamen Vermietern. Wir würden sofort wieder hinfahren. Wir hatten eine wunderbare Zeit in dieser herrschaftlichen Villa. Die Wohnungen sind sauber, bestens ausgestattet und die einzelnen Schlafzimmer gemütlich eingerichtet. Besonders genutzt wurde von uns der großzügige Wohnbereich mit dem Billardtisch im Erdgeschoss des Hauses. Die Vermieter sind überaus freundlich, kommunikativ und hilfsbereit. Sie haben den für den Winter schon abgedeckten Pool extra für uns noch einmal geöffnet, gereinigt und gewartet. Überdies haben sie uns eine Tischtennisplatte zur Verfügung gestellt und uns mit Schlägern und Bällen ausgestattet. Auch wurde uns nach einer Ferienwoche ein kompletter Wäschewechsel (Bettwäsche, Hand- und Geschirrtücher) angeboten. Haus, Anlage und Service waren also zu unserer vollsten Zufriedenheit. Wir kommen jederzeit gerne wieder! We verbleven met de familie (16jr tot 82jr) voor 14 dagen in dit prachtig huis en werden ontvangen als koningen. Super vriendelijke eigenaars! Er was zelfs fruit en drank voorzien als welkom! Ook voor de hondjes waren er drinkkommen en manen voorzien. Hele mooie villa en zwembad die goed onderhouden werden. Eigenaars vlot bereikbaar en ik kreeg snel antwoord op al onze vragen. Top vakantieplaats! nous étions attendus par les propriétaires à nôtre arrivée, accueil de rêve , visite des lieux avec à chaque étage des présents de grande qualité, plateaux de fruits, boissons fraîches, et aussi les meilleurs vins de Chianti et j'en passe!!... que du bonheur, des gens adorables qui vous font passer les sentiments vrais avant le (Business). Bravo et un grand merci. On va le chanter sur tous les toits. la famille Yvon Lambure de Bayonne. We stayed at Monte Nisa with a group of friends. We were 8 in total and rented both appartments. First, Monte Nisa is ideally located. 30 minutes from Florence, and 45 minutes from Siena. Other villages worth visiting, such as San Gimignano and Volterra are not too far either. There is no supermarket in Montefiridolfi, but nearby in the village of Mercatale there is a Coop market and a (very good) bakery! The owners of the House, Lucia, Filippo and their father are very friendly and keen to provide you with any necessary information about the surroundings. The house is very spacious, with 7 bedrooms (one single one) and 2 bathrooms. The house was built in 1934 but has all modern facilities. The kitchens are both very well equipped. Unlike other holiday houses that we have visited with the same group, this house has it all. Enough glasses, enough cutlery. A toaster, a modern cooking plate, a microwave, an oven, mixer, perculator. The hosts suprised us with fresh fruit from the region upon arrival. In total there were 10 beds at the pool. The pool is very spacious 10 meters diameter, about 1,20 deep ... perfect to cool down on a hot tuscan summer day. Depending on the season you might want to consider bringing insect repellent spray. (As you should anyway if you go anywhere in tuscany) . It's very quiet at night! We would definitely recommend this house for families or other groups!